#stampinup #faithfulinkspirations #onstage2017 I really like to participate in organized swaps. It takes the "hecticity" out of the swapping process. You don't have to run around like a maniac trying to find more people to swap with. And it takes the guesswork out of swap creation--how many should I make? One year I made 150 swaps. Not kidding! This time I made 13--10 for the organized swap, 1 for each of my downline members who attended with me, and one to keep as a sample for myself. Done and done. And I got back 10 wonderful swap cards in return--designs that I definitely wouldn't have come up with on my own! Each one its own work of art. Like this card I received from Jackie Walker in Florida. Jackie used the gorgeous Rose Garden Thinlits to cut the negative rose image from a 3-3/4" by 5" Whisper White panel. She used the Fine-Tip Glue pen to adhere the detailed rose to a 3-7/8" by 5-1/8" Flirty Flamingo mat. She wrapped a length of Flirty Flamingo Ruched Ribbon around the Whisper White panel before adhering it to the Flirty Flamingo mat with Stampin' Dimensionals. Jackie then adhered this assembly to a Thick Whisper White Card Stock card base, cut lengthwise. Next, Jackie stamped a sentiment from the "Wetlands" set in Basic Black Archival Ink onto a Whisper White scrap. She cut this out with the label framelit from the Rose Garden Thinlits. 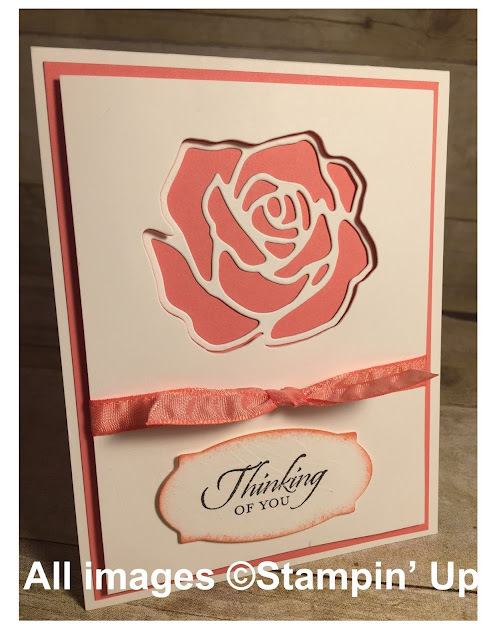 She sponged a bit of Flirty Flamingo Ink around the edges before adhering it to the card with Stampin' Dimensionals. So pretty, right! I'm going to have to try this--all you'd have to do is change out the sentiments to make a stack of all occasion cards. The "Rose Garden" stamp set matches the framelits that Jackie used and it contains some great sentiments.